Sharp new observations have revealed striking features in planet-forming discs around young stars. The SPHERE instrument, mounted on ESO’s Very Large Telescope, has made it possible to observe the complex dynamics of young solar systems — including one seen developing in real-time. The recently published results from three teams of astronomers showcase SPHERE’s impressive capability to capture the way planets sculpt the discs that form them — exposing the complexities of the environment in which new worlds are formed. Three teams of astronomers have made use of SPHERE, an advanced exoplanet-hunting instrument on the Very Large Telescope (VLT) at ESO’s Paranal Observatory, in order to shed light on the enigmatic evolution of fledgling planetary systems. The explosion in the number of known exoplanets in recent years has made the study of them one of the most dynamic fields in modern astronomy. Today it is known that planets form from vast discs of gas and dust encircling newborn stars, known as protoplanetary discs. These can extend for thousands of millions of kilometres. Over time, the particles in these protoplanetary discs collide, combine and eventually build up into planet-sized bodies. However, the finer details of the evolution of these planet-forming discs remain mysterious. SPHERE is a recent addition to the VLT’s array of instruments and with its combination of novel technologies, it provides a powerful method to directly image the fine details of protoplanetary discs . The interaction between protoplanetary discs and growing planets can shape the discs into various forms: vast rings, spiral arms or shadowed voids. These are of special interest as an unambiguous link between these structures and the sculpting planets is yet to be found; a mystery astronomers are keen to solve. 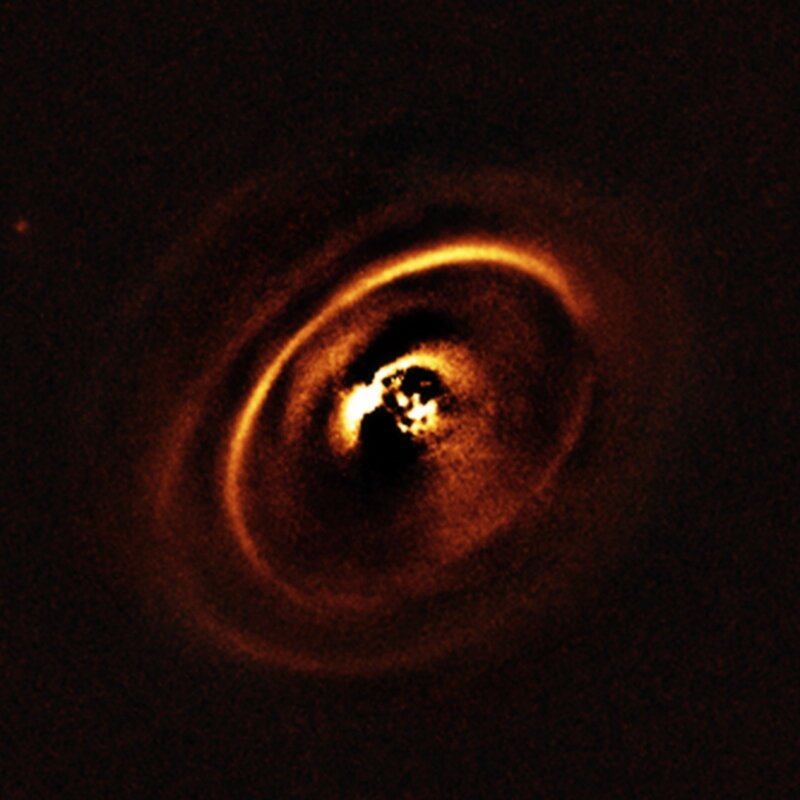 Fortunately, SPHERE’s specialised capabilities make it possible for research teams to observe these striking features of protoplanetary discs directly. For example, RX J1615 is a young star, which lies in the constellation of Scorpius, 600 light-years from Earth. A team led by the Jos de Boer, of Leiden Observatory in the Netherlands, found a complex system of concentric rings surrounding the young star, forming a shape resembling a titanic version of the rings that encircle Saturn. 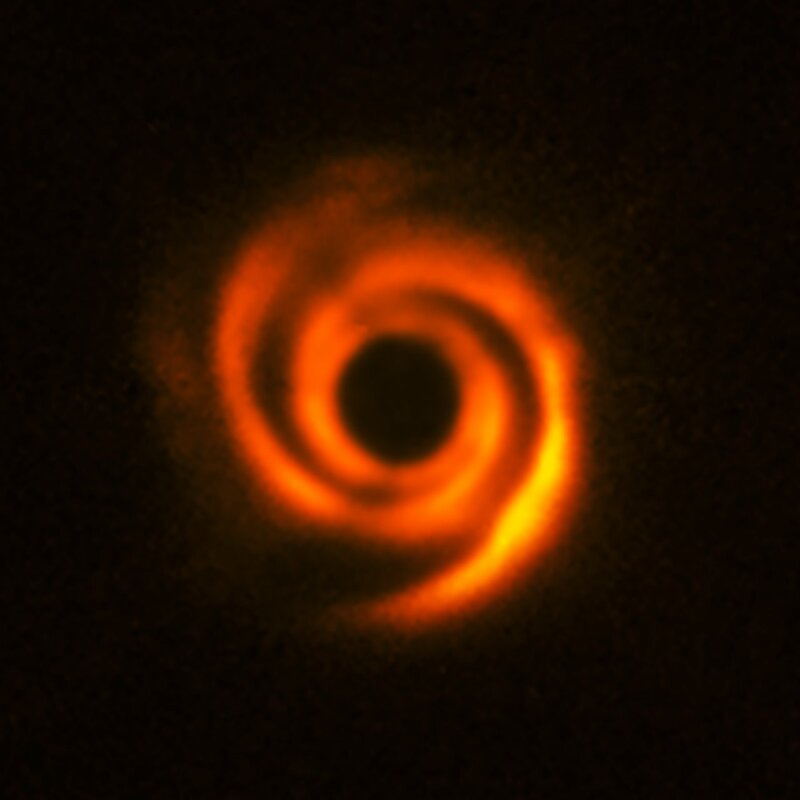 Such an intricate sculpting of rings in a protoplanetary disc has only been imaged a handful of times before, and even more excitingly, the entire system seems to be only 1.8 million years old. The disc shows hints of being shaped by planets still in the process of formation. The age of the newly detected protoplanetary disc makes RX J1615 an outstanding system, as most other examples of protoplanetary discs detected so far are relatively old or evolved. De Boer’s unexpected result was quickly echoed by the findings of a team led by Christian Ginski, also of Leiden Observatory. They observed the young star HD 97048, located in the constellation of Chamaeleon, about 500 light-years from Earth. Through painstaking analysis, they found that the juvenile disc around this star has also formed into concentric rings. The symmetry of these two systems is a surprising result, as most protoplanetary systems contain a multitude of asymmetrical spiral arms, voids and vortexes. These discoveries significantly raise the number of known systems with multiple highly symmetrical rings. A particularly spectacular example of the more common asymmetric disc was captured by a group of astronomers led by Tomas Stolker of the Anton Pannekoek Institute for Astronomy, the Netherlands. This disc surrounds the star HD 135344B, about 450 light-years away. 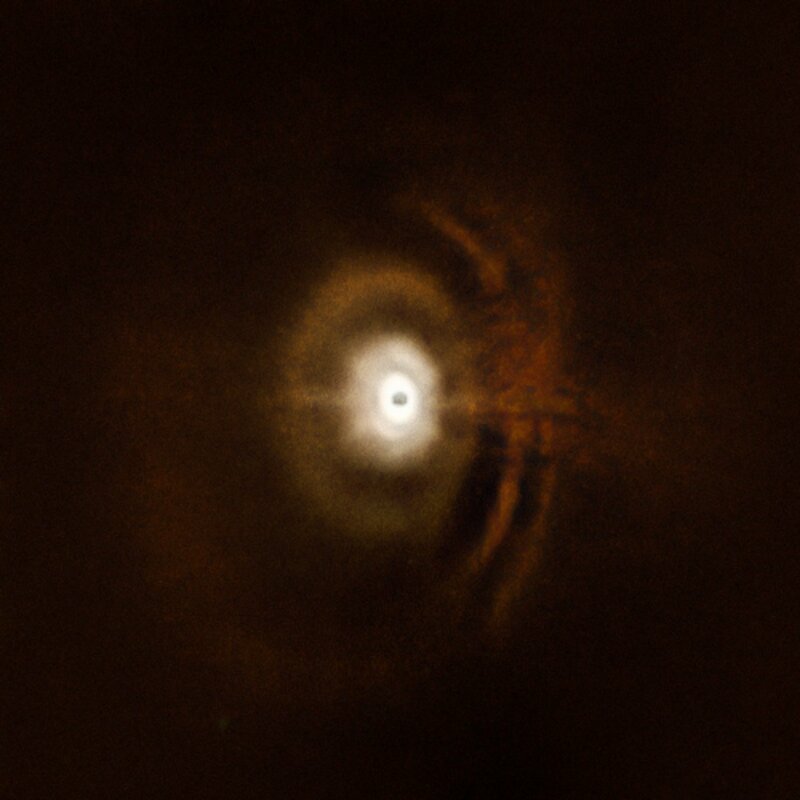 Although this star has been well-studied in the past, SPHERE allowed the team to see the star’s protoplanetary disc in more detail than ever before. The large central cavity and two prominent spiral arm-like structures are thought to have been created by one or multiple massive protoplanets, destined to become Jupiter-like worlds. In addition, four dark streaks, apparently shadows thrown by the movement of material within HD 135344B's disc, were observed. Remarkably, one of the streaks noticeably changed in the months between observing periods: a rare example of observing planetary evolution occur in real time, hinting at changes occurring in the inner disc regions that can not be directly detected by SPHERE. As well as producing beautiful images, these flickering shadows provide a unique way of probing the dynamics of innermost disc regions. As with the concentric rings found by de Boer and Ginski, these observations by Stolker’s team prove that the complex and changing environment of the discs surrounding young stars are still capable of producing surprising new discoveries. By building an impressive body of knowledge about these protoplanetary discs, these teams are stepping closer to understanding how planets shape the discs that form them — and therefore understanding planet formation itself. SPHERE had first light in June 2014. The instrument uses advanced adaptive optics to remove atmospheric distortion, a coronagraph to block most of the light from the central star and a combination of differential imaging and polarimetry to isolate the light from features in the disc. The research of de Boer, Ginski and Stolker and their colleagues in the SPHERE consortium is now accepted for publication in the journal Astronomy and Astrophysics. Their papers are entitled: "Direct detection of scattered light gaps in the transitional disk around HD 97048 with VLT/SPHERE"; "Shadows cast on the transition disk of HD 135344B: Multi-wavelength VLT/SPHERE polarimetric differential imaging", and "Multiple rings in the transition disk and companion candidates around RX J1615.3-3255: High contrast imaging with VLT/SPHERE". All three of papers have been created in the framework of the SPHERE GTO program, led by Carsten Dominik, University of Amsterdam. Research paper by Jos de Boer et al. Research paper by Christian Ginski et al. Research paper by Tomas Stolker et al.